The Fourth » In panel 1, Skärva does his best impression of The Internet. In panel 1, Skärva does his best impression of The Internet. Here, have a detail from this comic. She got covered up more than I’d have liked! …she looks like a salamander, I think. I’m calling it: As per videogame pallet-swapping tradition, this is Posthumous’s pirate counterpart! His name is Plankhumous. These lizard people look pretty cool! Especially that Umbreon-patterned one. It’s actually a she. ._. Oh. Yeah, I had no idea what he was talking about. Probably should’ve tried to figure that out before saying something dumb. Wait, that’s a she? FINALLY, SOMEone remembers that reptiles and amphibians don’t have MAMMALIAN FEATURES. I officially love this newt/salamander race. And yeah they look awesome too; gonna have fun seeing what kind of skin colors come on these, just like with flish. Wow Cyril just found his fanbase! And thank you for putting Ponytail Lurkin and Popeye Lurkin back in. They need names! Maybe Polly and Pete? Can’t resist the Polly reference . . .
And let the overuse of “avast” and “arr” and other pirate-y vocabulary COMMENCE! …yeah i should sleep now. Feel free to make up backstories for them too. Are they brother/sister, or a couple? Captain and first mate? Hmmm . . . I think they do look related, but that might just be the matching shirts, lol. But they could be a bro/sis twin duo (because I’m an avid fan of twins, being one), working guns on a pirate ship. I’ll pass on the captain thing; they’re mingling too well with the randoms, and that may be too ironic anyways. Instead, they’re the fastest cannon loaders on the high seas, and on a pirate ship, firing your cannon faster can make a world of a difference. They’re also experts with other guns too, if you have those in this world. If its got gunpowder, they deal in it. Her weapon of choice are two pistols (cutlass for close combat), and he uses a rifle (or fist in close combat). She’s the brains of the outfit while he’s the brawn. Being the brains, she may also be an officer on a boat; she does have a fancy hat (and that’s all that Jack Sparrow seems to require, lol). I love it! I want to draw them now. Well, again, I mean. And, yep! I decided to focus on them as per your request! That’s what I appreciate about your duo’s worldbuilding; you actually think this stuff out. And you make very interesting races that are more unique than the usual “elf”, “dwarf”, “demon person who’s really just a human with wings and horns and an angsty backstory”. YAAAY Thanks! Yay for cool background bodies. Skärvs did a lovely impression of the Internet. It yells the same thing to me everyday. The new species is amazing so far…i can’t wait to see more of them, and hopefuly they’ll get their own encyclopedia entry. I’m guessing they haven’t heard him play yet. I swear it was not my intention to have a race of Jollies walking around, it just turned out that way. 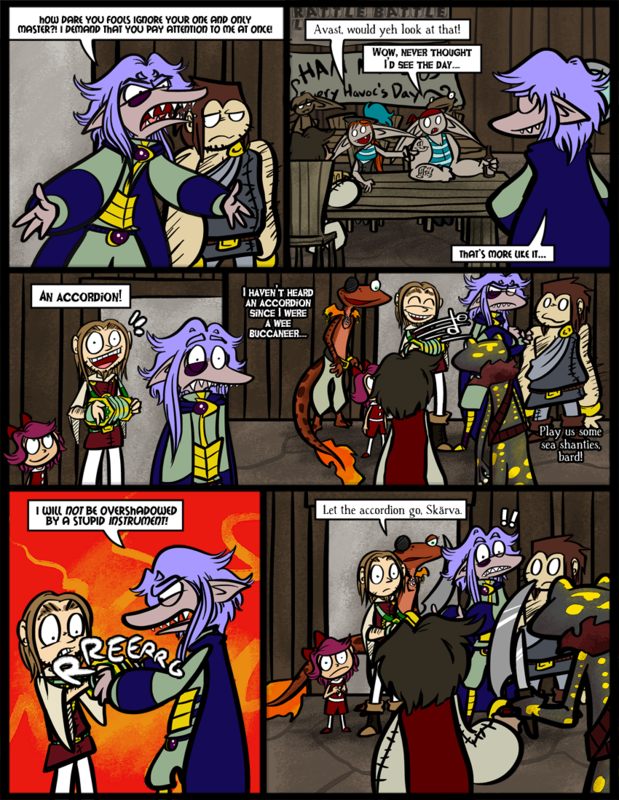 Do you normally overlap panels like you did for panels 3 and 4? Skarva in 3 sort of just edges over into. I feel like I haven’t seen that before…but maybe I have and just haven’t noticed. Note to self: proofread BEFORE posting, not after. I also think its just creative and cool. Where did those weapons come from? Oh wait, HAMMERSPACE. Lizards and salamanders are both chordates, so I was sort of right… I am grasping at straws here. Actually, not in this case! They all have scabbards, you just can’t really see them… but that’s what the belts/straps are for. Some large weapons for hidden scabbards… Wait, I got it, MAGIC. Clearly it’s nobody important. Skaerva is just shocked that people care about an accordion more than they do about him. I knooow he has Blank sleeves but honestly, no relation. The lady salamander pirate is SO COOL. Is she going to get a name? She needs a name. And to be fair he just announced himself. They DID notice him, they just didn’t care. I would but I don’t know if there are special naming conventions for the new species/race/whatever. They are very vibrant creatures. And tall too! 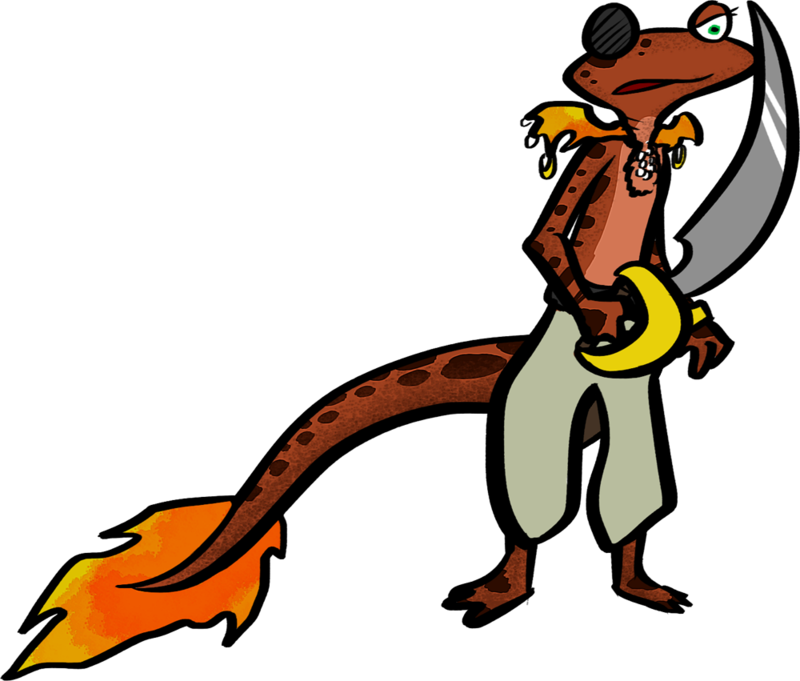 If pirate lady doesn’t have a name I’m calling her Saltwater Sally, because that’s a pirate name and, well,….Sally….salamander…..do you see where I’m going with this? I’ll still give Nix first pick… wouldn’t calling her Sally be a strange pun? Like if my name was a play on “human”. Y’know, Paper Mario was always pulling stuff like that. I mean what kind of Goomba names their kid Goombario? Goombella? …How do Goombas have babies? At risk of getting all technical, real life fungi can reproduce both sexually and asexually (with SPORES) which is why they are some of the coolest organisms EVER. Not that real life has ever had any bearing on Mario at all. The idea of the name Sally is hilarious especially considering I was pondering the name “Kezeri,” which is the species name of a specific kind of salamander. …and why was I not surprised that they liked Cyril more than Skarva? Don’t be sad, Skarva, I’m part of your fanclub! Arrr, these be pirates, with pirate-speak and everything! Totally legit. Well, when a mommy Goomba and a daddy Goomba love each other very much, they……I have no idea. They’re mushroom people, aren’t they? Maybe they plant a seed or something. Oh yeah, you gotta love PM puns. Like Bombette, haha. Humania? Haha. That’s just silly. (…no offense, Humania.) I wouldn’t want to name my daughter after humans anyway, they tend to be kind of jerks. Well, mushrooms make spores, so uh, maybe they blend spores. -WAIT a goshdarn minute, as per Yoshi’s Island, the storks just bring the babies in the Mushroom Kingdom. Ah! Problem solved. They do make spores, don’t they. ._. Well, I made that comment at midnight, don’t listen to me. Well yeah, but so are Goombas for the most part. There’s about four “good” Goomba characters in PM compared to the hundreds Mario has to fight. But where do the storks get the bab–okay let’s just drop this conversation. And I forgot to hit reply! Good going, Jello. And now Skarva blows the bar up!